Can you get a Loan for a Dump Truck with Bad Credit? If your credit is at least 600, you can often get into a dump truck with minimal down payments. It really depends on what the credit issues are. Past due child support makes it almost impossible to get financing. Other issues, like late payments or past bankruptcy can often be overcome. What if your credit is really bad? A larger down payment or collateral can usually make the deal work. Have you been in business for 2 years or more? Well, dump truck loans will cost more than at the bank or the dealer, but you shouldn't have any real problem getting one. In general, dump truck buyers we talk to are looking at trucks that range from around $30,000 to $80,000, with the average being around $40,000. The range has to do with whether your credit is on the higher or lower end of the range, your liquidity and other issues, such as the strength of your monthly cash flow and profits, etc. In general, with "good" or "OK" credit, the down payment needed will be the first and last payment in advance, though down payments can sometimes be higher for startups. If your credit is below that 600 range, many dump truck buyers still have some options. Payments will be higher, and lenders will often not be comfortable with a four-year term, but there often ways to finance your dump truck. Dump trucks are considered hard assets. There are more opportunities to finance construction equipment than for many other types of assets. 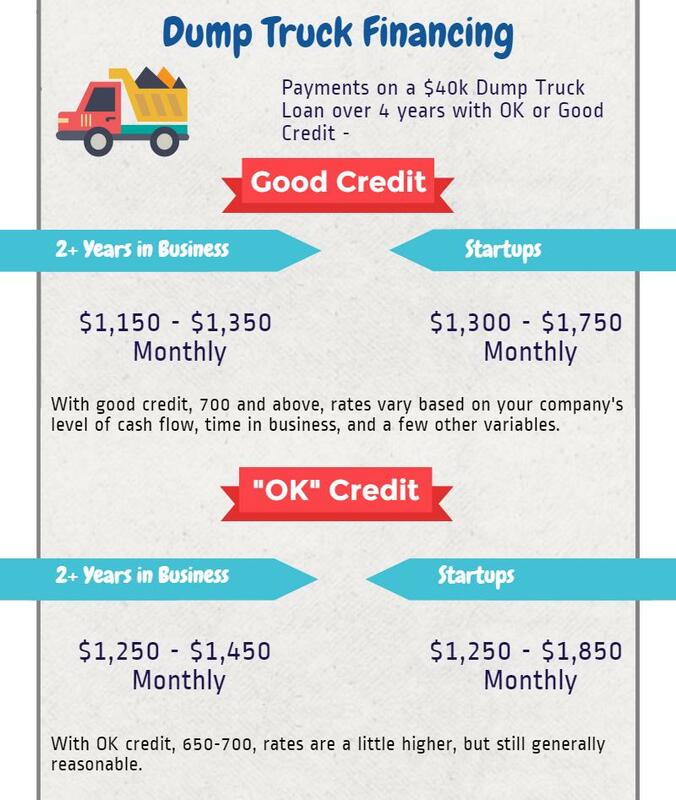 If you've been in business for at least 1 year, and your monthly revenues equal the cost of the dump truck you're buying (So, to purchase a $25,000 dump truck, you'd be doing at least $25,000 in monthly revenues), in most cases financing can be secured. There are several options for collateral-based lending. Collateral means if you putting up assets (like other trucks) to secure the loan. Collateral lenders often look for a 2:1 ratio, with the dump truck being part of that - so if you're buying a $15,000 dump truck, if you can put up $15,000 worth of collateral (or less, but have a security deposit) there's usually no problem getting financing. To get an idea of what your collateral would be worth from a lender standpoint, you can try looking up auction results online at places like TruckPaper.com. What are Dump Truck Payments With Bad Credit? ...it depends greatly on the length of time you can be approved for, the size of your down payment and collateral, and exactly how bad your credit situation is. Payments will much higher than if your credit was good. You might even even be happy when you start seeing offers. Consider payments versus what the dump truck will provide you. ...but that doesn't make high payments a bad idea. The optimistic view: After my payments of $850 a month, I end up making $7,150 in profits, which really isn't much difference from the $7,400 in profits I'd make if I had the lowest payment. ...but find high payments for your dump truck is usually 10X better than no payments and no dump truck. Smarter Finance USA can help you finance a dump truck with good or bad credit. You may contact us, or you may call at (866) 631-9996.